This guest post is by Impact Arts tutor Tomasina Hurrell. This community arts organisation has a project called Craft Café , which works with older people to tackle isolation and loneliness. 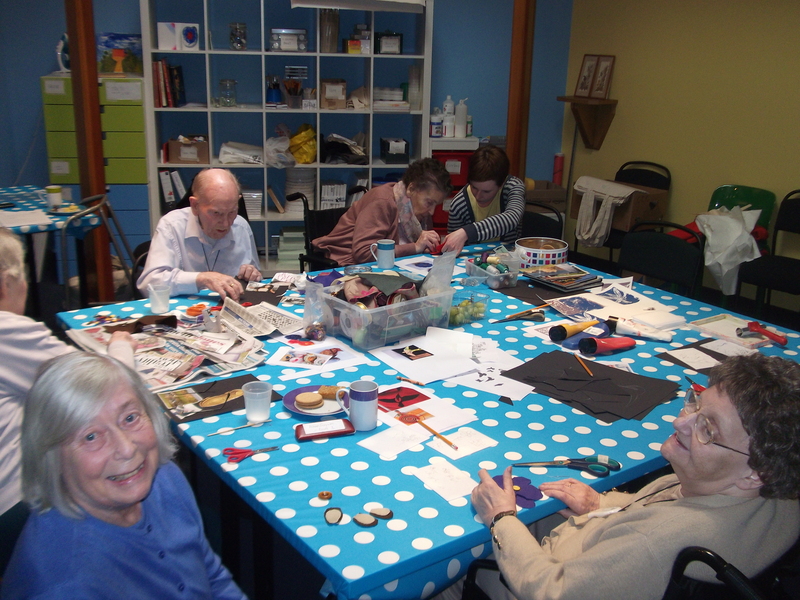 Craft Café has now arrived in Edinburgh in partnership with Viewpoint Housing Association. Edinburgh’s first Craft Café has been set up in an unused chapel which is attached to the residential homes St Raphael’s and Marion House, both part of Viewpoint Housing Association. The Chapel has been lovingly restored and brought back to its former glory, with many of the residents and care workers who knew the chapel previously expressing delight in the space being put to good use again. Viewpoint Housing Association also has sheltered housing around Edinburgh, so one important aim is to encourage and support participation from tenants’ out-with the residential complex to attend. This has already begun to happen and means that people from each part of Viewpoint are integrating and experiencing the chance to meet new faces, an opportunity integral to the Craft Café philosophy. After just four weeks of taster sessions the workshops already have a strong following. Members have stated that they are happy to know that the Café is here as they thoroughly enjoy coming for the company and the chance to learn something new. 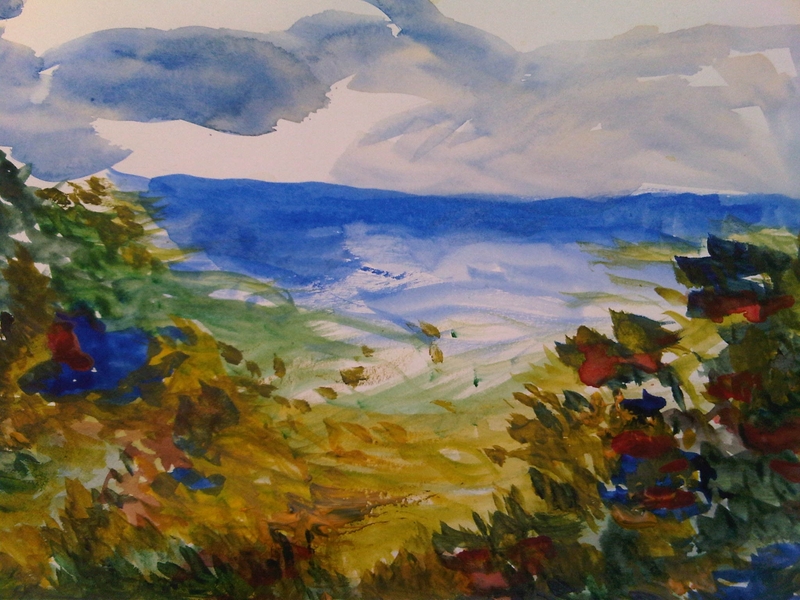 So far through the taster sessions the members have been taught fine art practices – drawing, printmaking and painting. They have also had the opportunity to experience craft activities such as jewellery making and textiles. For some, the process of learning is therapeutic and confidence boosting and already we can see that there is a great deal of talent in the Café. For those who have more challenging issues, the process of mark making and working with colour and texture appears to have a calming effect. For those who have skills from earlier life, the process of passing that skill on to fellow members can be very beneficial. One member from sheltered accommodation is a jewellery maker and at the Café he has had the opportunity to show his work and share his technique with others. Edinburgh’s first Craft Café is already coming alive and has great potential for the future. The members make it a diverse and social space and as they start to develop more autonomy they should begin to feel more ownership of the café. It’s been a great start! For more information about Craft Café in Edinburgh, please contact Jay McAllister, Impact Arts’ Regional Manager for Edinburgh and Borders on jay@impactarts.co.uk or 0787 5068259. Learn more about Age Scotland’s ending isolation campaign. Find out about Luminate, Scotland’s creative ageing festival. This entry was posted in Active Ageing, Guest bloggers and tagged Around Scotland, ending isolation, guest posts, Inspiration, older people by Age Scotland. Bookmark the permalink. Hi Stuart, how wonderful! We don’t have a specific newsletter about creative craft shows but both ourselves and our partner Luminate (who run Scotland’s creative ageing festival) post regularly on our Facebook pages about local events. You can view these at https://www.facebook.com/agescotland and https://www.facebook.com/LuminateScotland/ We hope that helps. Thanks for getting in touch!